There’s something thrilling about dipping into a debut novel, but rarely is the enthusiasm matched by such unerring skill as this. In Sarah Hilary’s confident hands we’re securely led through a tale woven from multiple viewpoints and with multiple crimes – a juggling act she adeptly controls from intriguing epilogue of Someone Else’s Skin to the satisfying closing sentence. It’s an impressive feat, but one achieved thanks to Hilary’s obvious respect for all the characters she creates, as well as the real life situations she draws inspiration from. It takes courage to tackle the subjects Hilary delves into – domestic atrocities far more complex than murder. She introduces us to characters so real that if they were to accost you in a pub, begin pouring out their sorry tales, you might want to run. But Hilary makes us stay, listen, take in all the different and conflicting levels of their damage and betrayal, and gradually come to understand that even the worst of her villains began as a victim – no one is just one thing, from surface to core.From the girl stolen from Uganda to save her from child soldiers, to the woman blinded in one eye by her own brothers, these are each tales deserving of an entire novel of their own, but in weaving them together Hilary ensures the impact is enough to send tremors through you as you read, and continue to ring out after you put the book aside. There are moments so chilling (the cupboard under the stairs with “the ammonia stink of a scared animal” is a distinct one) that I reached for my partner for reassurance. But it’s also an exhilarating read – with enough warmth shot through to carry you through the most painful scenes. It makes you wonder how you would answer that question, which, as the book continues, becomes an increasingly important one. Hilary has shown herself to be skilled at on-the-edge-of-your-seat writing, but also imbuing her sentences with warmth, humanity and beauty at the most unexpected moments. A true master of her art, and this is only her debut. A tautly written, disturbing but ultimately compassionate novel. 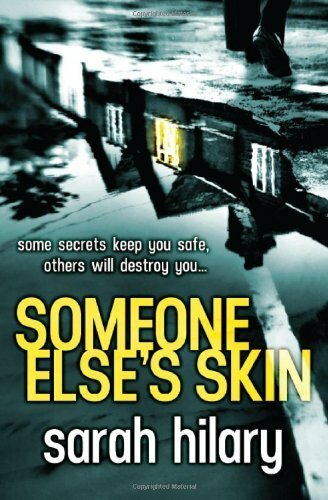 Someone Else’s Skin by Sarah Hilary is published by Headline and is available to buy from Amazon. I’m always happy to consider publishing reviews. To submit or suggest a book review, please send an email to Judy(at)socketcreative.com. This entry was posted in Reviews and tagged Book reviews, crime novels, Di Marnie Rome, Sarah Hilary, Someone Else’s Skin by Judy. Bookmark the permalink.